An all day participatory event discussing the relevance of art in the urban environment within our small Cornish towns and how public or street art can encourage participation from diverse groups and increase visibility of community art projects. This event is aimed at illustrators, designers, graffiti and street artists or those with an interest in public art. Participating in live artwork will be a lively and interactive way of forming new connections, learning and forming action groups for future projects. Art in the Urban Environment starts with an all day participatory event and talk with Charlie Sherratt at The Fish Factory . 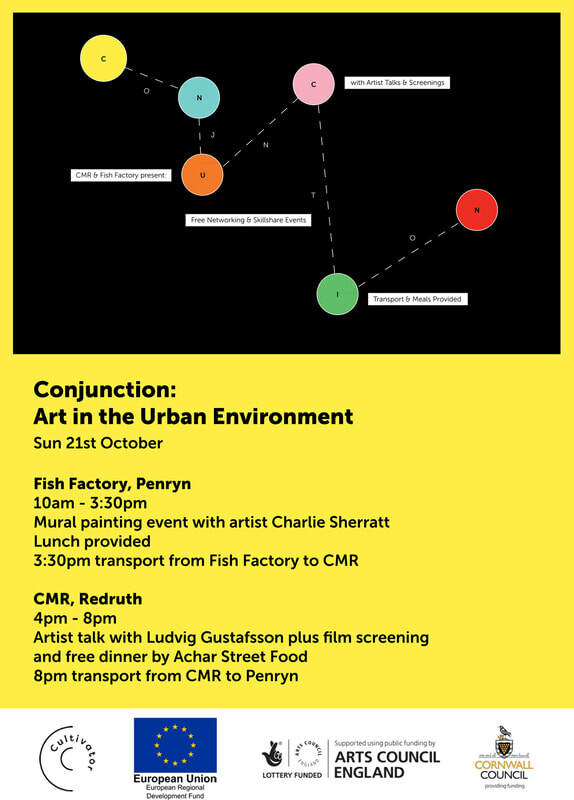 A free lunch will be provided to all who book via Eventbrite, with free transport to CMR in Redruth to see an artist talk by recent RCA graduate and current Fish Factory artist in residence Ludvig Gustafsson from Sweden. This will be followed by a free dinner from Achar Street Food and surprise film screening. Transport will be provided at 3.30pm to our linked CMR Conjunction event. Conjunction is a series of regular artist networking events as a collaboration between The Fish Factory and CMR Project Space, with skill shares, artist talks, screenings and socials with free dinner and lunch and transport to and from Fish Factory and CMR.The aim is to bring artists together and see the possibilities with the available resources at both venues and to give people the opportunity to socialise and meet other artists. Please book your place if you would like to join us - The Fish Factory and CMR events can be booked separately or together, with or without transport - so please make sure you choose the right option! You can find the Fish Factory day event HERE. Delivered in partnership with Cultivator and supported by the European Regional Development Fund, Arts Council England and Cornwall Council.